Some of the major players in social media and messaging apps, including Facebook and Telegram, have already announced their plans to issue their own cryptocurrencies. These networks have hundreds of millions of active users with entire ecosystems built around offering those users a range of products and services. We believe that issuance of a native cryptocurrency by a social network can significantly transform that network’s business model, and enhance its revenue and net margins over the long-term. Currently, social networks and messaging apps generate their revenues primarily by posting advertisements. Implementing a crypto-based economy has the potential to increase revenue and net margin by supplementing existing advertising revenue with crypto payment commissions. With the help of a native cryptocurrency, users will be able to pay for all digital and physical assets, including paid content or subscription services, sold by individual merchants within that social network’s ecosystem. 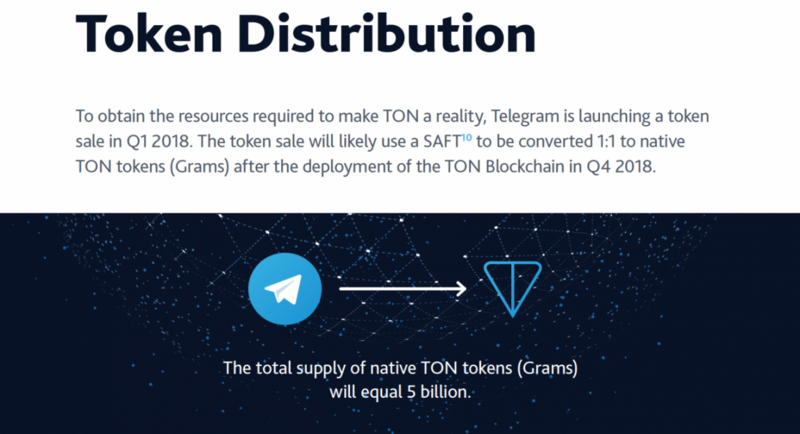 In this article, we examine these assumptions by reviewing a specific case for Telegram and its native TON coin (the Gram), and assess potential consequences the TON coin might have on Telegram’s revenue growth and net margins. Currently, there is no cryptocurrency used for regular transaction purposes on a popular, daily level. No cryptocurrency has been able to reach mainstream adoption by meeting the consumption needs of hundreds of millions of people and attracting transaction volumes from mass markets. The demand for existing cryptocurrencies comes primarily from investors and traders, not consumers. This problem statement lies at the core of the Telegram’s strategy and vision: To create a TONbased economy on top of its 1 billion user base (by Jan 1, 2022) and make the TON Coin a truly mass-market cryptocurrency. We believe that Telegram is uniquely positioned to create the first mass-market cryptocurrency. Its pre-existing 300-million user base can serve as the critical mass necessary for the ecosystem to grow and eventually achieve global adoption. In 2018, Telegram raised $1.7 Billion in its ICO, which became the second-largest (nongovernmental) ICO ever conducted. Funds raised during the ICO were intended for investments in the development of Telegram Open Network (TON) and related blockchain, peer-to-peer, distributed storage and service hosting technologies. As indicated in the Roadmap presented to investors during the ICO, the main milestone was the creation of a TON-based economy in Telegram. 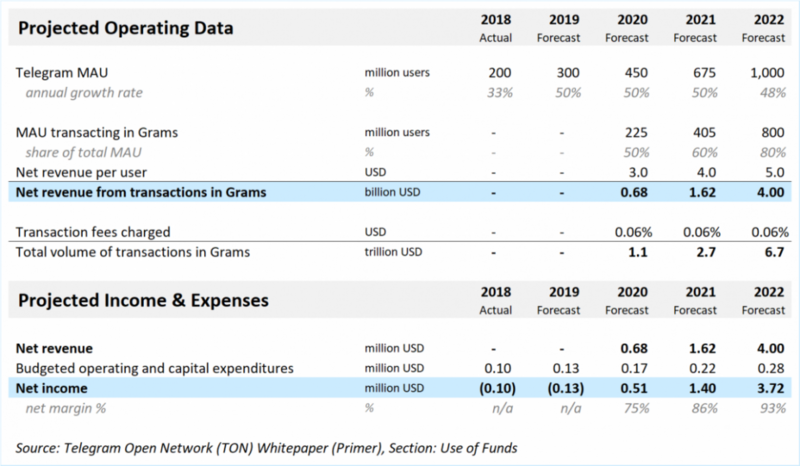 TON’s Whitepaper provides more details on this milestone, specifying that it includes the deployment of the stable version of TON with its revenue-generating services, the launch of Telegram Wallet, and the launch of the TON Coin (or the Gram). The TON Coin, called the Gram, will become the principal cryptocurrency of the TON Blockchain and will be used to make peer-to-peer transactions for all digital and physical assets sold by individual merchants within the Telegram ecosystem. Essentially, the Gram will become the core component of TON-based economy. Based on our research, we believe that the TON Coin (the Gram) will become the primary revenue-driving factor for Telegram and will transform a not-for-profit organization into a highly profitable enterprise. If the TON-based economy in Telegram is successfully developed and adopted by its global user base, the TON Coin could generate an incremental net revenue of up to $4 billion by 2022 for Telegram. It is assumed that by Jan 1, 2022 Telegram will achieve 1 billion monthly active users (MAU), of which 80% or 800 million MAU will be actively transacting in Grams, and the net annual revenue per user will constitute $5. The first important assumption here - an estimate of 1 billion MAU by Jan 1, 2022 - is derived from the Telegram’s ICO investors presentation and was set by the Telegram’s team. It implies a 50% annual growth rate in MAU starting from an actual value of 200 million MAU in 2018. We believe this assumption is realistic and achievable. The second critical assumption - $5 in net annual revenue per user - is supported by our industry research and comparable companies analysis. In particular, we have analyzed two competitors - WeChat Pay and Google Pay. WeChat is one of Telegram’s most comparable apps in China. Though WeChat is not built on the blockchain and does not have its own cryptocurrency, the two apps are somewhat similar in terms of growth strategy and business model. WeChat is a decent peer for comparative analysis, because it already has a stunning 79% market penetration in China, and WeChat Pay's market share in mobile payments transactions in China equals 40%, with Alipay controlling 54%. Based on our estimates, WeChat’s payment service - WeChat Pay - generated $5.6 in net revenue per user in FY2017. In 2017, WeChat Pay had processed $8.5 trillion worth of mobile payment transactions globally and was earning 0.06% per transaction on average. WeChat Pay segment’s net revenue for FY2017 was $5.1 billion, generated by 900 MAU. Another good example comes from Google Inc., which, according to the latest research, earns $6 in net revenue per user from its Google Pay operating segment. 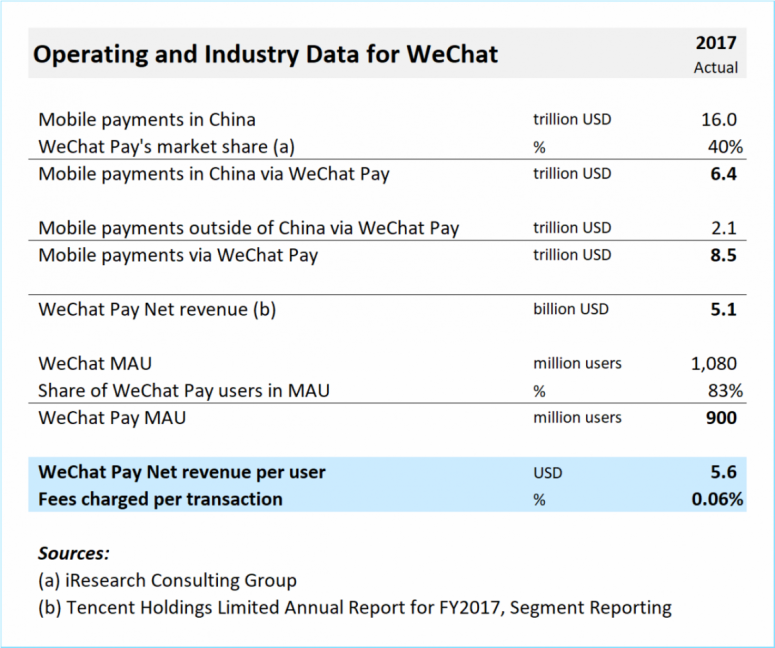 Both metrics - $5.6 for WeChat Pay and $6.0 for Google Pay - suggest that the value of $5 in ‘net annual revenue per user’ is a reasonable assumption for Telegram. 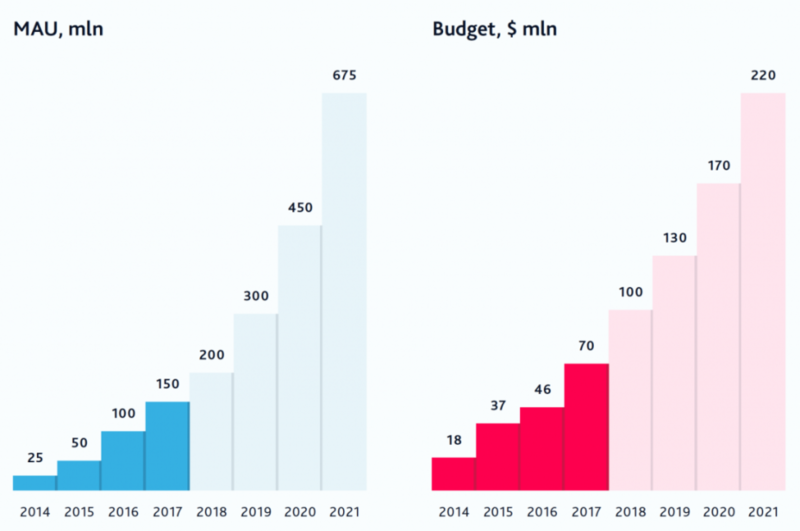 Therefore, if we take the projected numbers of MAU, presented by Telegram’s team to its ICO investors in 2018 (see below), we can build a revenue forecast of $4.0 billion by 2022. Importantly, even after taking into account the company’s budgeted operating and capital expenditures, the net profit becomes positive beginning from FY2020, and the net profit margin also remains high. To put it simply, the company is very cost efficient. This means that the margin of safety and the earnings power of Telegram is expected to be high, which will drive investment returns to its equity (token) holders. As was mentioned by Telegram in its ICO presentation, the tokens sold during the ICO will be converted 1:1 to native TON Coins (Grams) after the deployment of the TON Blockchain. This means that the growth and profitability of Telegram will have a proportionate impact on the market value of TON Coins (Grams), making them an attractive investment. Telegram’s user base, estimated to reach 300 million by the end of 2019, can provide the required critical mass to push the Gram cryptocurrency towards widespread adoption and make it a truly mass-market cryptocurrency. Integrated into Telegram applications, the TON wallet will become the world’s most adopted cryptocurrency wallet. Such widespread adoption of the Gram could create a solid revenue stream for Telegram and become a primary revenue-driving factor going forward. Even under conservative assumptions, the cumulative revenue over the three years (2020-2022) could constitute $6.3 billion. With the launch of Gram, a whole new economy will originate with goods and services sold for Grams – similar to WeChat’s fiat-based marketplace, but built on a fast, secure, and scalable blockchain network, capable of handling millions of transactions per second. Similar to WeChat Pay’s revenue stream of $5.1 billion per 900 million MAU, Telegram’s TON Coin will be perfectly positioned to generate up to $4 billion per its 1 billion MAU by 2022. Moreover, due to Telegram’s forecasted high net profit margins, compared to WeChat, Telegram is expected to provide a substantially higher return on investment to its token holders. Telegram has committed to converting its tokens 1:1 into native TON Coins (Grams) after the deployment of the TON Blockchain. Therefore, investors in Gram coins are expected to benefit from the Gram’s market price appreciation in proportion to the market price appreciation of Telegram tokens. While Telegram is a not-for-profit business, the launch of a native cryptocurrency has the potential to bring in massive profits. Facebook’s native cryptocurrency project, and other similar endeavors, can also be assumed to have a comparable effect, and the earnable revenue from payment systems may serve as a way to supplement advertisement-based income. While it is unlikely that social networks will replace advertising revenue with cryptocurrency payment commissions, they may have the chance to embrace an entirely new monetization model, radically different from the current status quo. This report is for information purposes only and should not be considered a solicitation to buy or sell any cryptocurrency or cryptocurrency product. Monfex accepts no responsibility for any consequences resulting from the use of this material. No representation or warranty is given as to the accuracy, timeliness, or completeness of this information. Consequently, any person acting on it does so entirely at their own risk. © 2019 Monfex. All Rights Reserved.